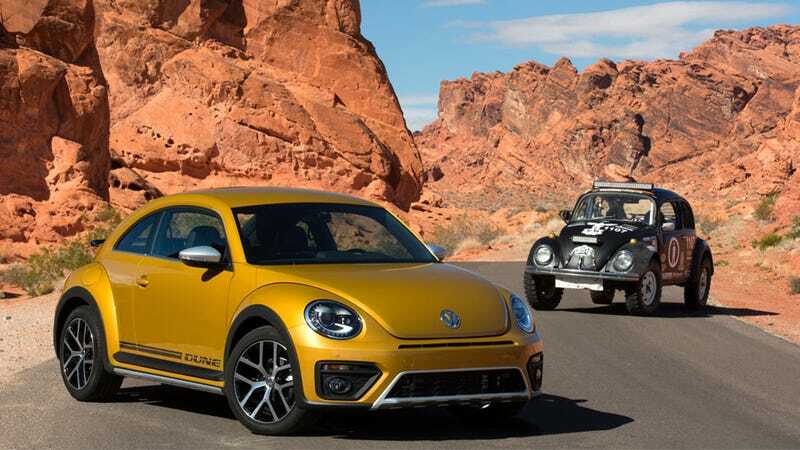 When Volkswagen showed their modernized take on the Baja Bug as a concept back in 2014, I liked the look, but was a bit disappointed in the specs, and skeptical it would make it to production. I was wrong! They will build it, and it looks great, though it’s still pretty much just a costume. The Dune (still not the one with Maud’Dib or sandworms or the Bene Gesserit or any of that crap) keeps pretty close to the butched-up-Beetle look of the concept, right down to the golden yellow color, but some obvious changes have been made to make it something reasonable for production. The front in-bumper light units have been made out of parts normal humans can afford to own, the skid plates and side cladding are more rationally matte-finished, there’s a new air intake up front, the hood is the same as the stock Beetle instead of the ribbed variant on the concept, the light units are stock, and so on. Still, even with all the pandering to the realities of production, the car still keeps the great look of the Dune concept. That’s good, because it doesn’t really offer much more than that. Sure, it’s been raised by a staggering-for-voles 0.4”, has a 0.6” wider track, and has 18” wheels, but only the front pair of those wheels is actually driven, and the drivetrain (170 HP/184 lb-ft 1.8-liter turbo four) remains the same as the normal Beetle. Inside, the 2016 Beetle Dune features sport seats with contrasting orange stitching and a leather-wrapped multifunction steering wheel. Standard equipment includes the latest generation MIB II infotainment system, which serves as the foundation for Volkswagen’s available Car-Net® suite of features. VW Car-Net connectivity includes App-Connect technology which allows integration with the three major smartphone platforms—Apple CarPlay®, Android Auto™ and MirrorLink®—allowing seamless integration for compatible smartphones. Honestly, for most people, that’ll be fine. It’s pretty unlikely anyone will be doing any real off-roading in one of these beyond a few giddy drives over a moist lawn, but, screw it, at least it’s a car with a sense of fun that doesn’t take itself too seriously. I know most people compare these to Baja Bugs (like what our own Raph likes to roll) but visually they seem closer to the near-stock Class 11 Beetles that race at Baja. Which is why it’s appropriate to see a Class 11 in the top image up there, and more exciting to see that I think that’s Jim Graham’s ‘69 Class 11 Beetle from Desert Dingo Racing. In fact, I know it’s the Desert Dingo Beetle, not just think, because I’m talking to Jim as I’m typing this. Just for the record, I’m pretty sure that old ‘69 could kick the crap out of the brand-new Dune off-road. Just much less comfortably. The Dune will be available as a convertible as well as a hardtop, and I bet at some point soon somebody will cut down those fenders, install some real offroad suspension and an AWD system, and we’ll get the real modern Baja we’ve all been secretly pining for.